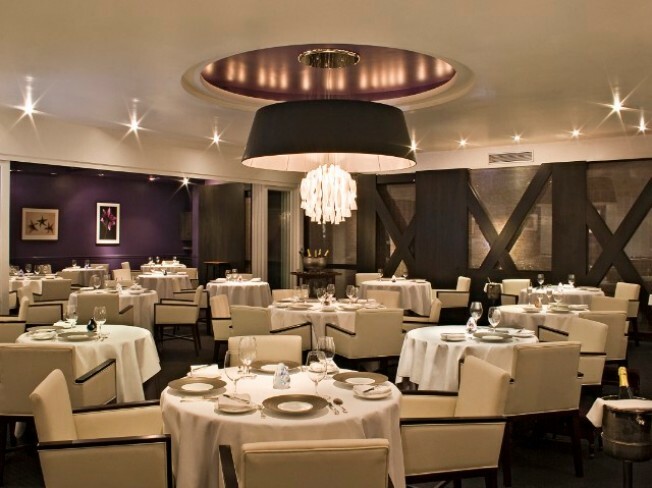 Open Table suggests Melisse as a private dining choice. Private dining: It's a concept that is practiced year-round, but come the holidays, when businesses want to thank clients, and other people want to thank some more people, and families want to celebrate together, without disturbing other diners with their antics and frivolities, private dining truly comes into focus. OpenTable: The make-reservations service recently introduced a "private dining" section, offering a look at over 70 eateries that offer away-from-the-bustle meals. On the list: Melisse. Grace. Henry's Hat. And the Restaurant at the Getty Center. Plus several more. Plus several restaurants in Orange County. Melisse: We were eyeing the menu, and decided that our afternoon might be made more holidayish with a bowl of the butternut squash soup, complete with apple, ris de veau, and truffle mousse. It is $23. Do we feel special when we're in a banquet room? We do. Like there is extra fussing-over-us going down, and everyone can use a bit more of that in life from time to time. And if you've only enjoyed a banquet room say at a large wedding, where you're one of 400, try organizing a smaller party for an evening. It's just like dining at home, but with kind people refilling your water glass every few minutes.